From the early stages of the Transit program, it was recognized that nuclear power provided an alternative to solar power for satellites, but it was not clear which would be better for the Transit satellites. Nuclear power, tested on Transit 4A and 4B, showed good results, so it was decided to have two series of prototype operational satellites. The Transit 5A series, which evolved into the Transit 5C-1, had solar power, whereas the Transit 5B series had nuclear power. Three 5B series satellites were launched by Thor-DSV2A Able-Star rockets with piggyback Transit-5E series satellites. The 5E series were launched to obtain environmental data in the vicinity of the operational orbit of Transit satellites and used solar power. 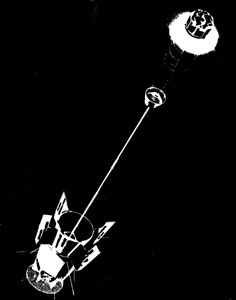 Transit 5BN-1 was launched on 28 September 1963 into an excellent orbit. Unfortunately, the satellite developed a problem that kept it from being fully useful as an operational satellite for navigation: It achieved gravity-gradient stabilization upside down, and thus the signal level was too low for operational users with lowgain antennas. However, geodetic and navigational evaluation data were obtained. Transit 5BN-2 was launched on 5 December 1963 and became the first operational navigation satellite. It was used regularly by both surface and submarine units of the Navy until November 1964. From the time that Transit 5BN-2 became operational, at least one satellite has been operational for routine use by the Navy. Transit 5BN-3 was launched on 12 April 1964 but failed to achieve orbit, after which it was decided that the operational satellites would be solar powered because of the lower cost and the need to obtain special approval to launch each nuclear-powered satellite.